The sun warmed this Northwest Washington weekend and was very inviting. I packed up my bike and headed north. at Burlington, I veered west to Chuckanut Drive. This road follows the shoreline to Bellingham and offers incredible views of the islands to the west. It became part of the state highway system in 1895. 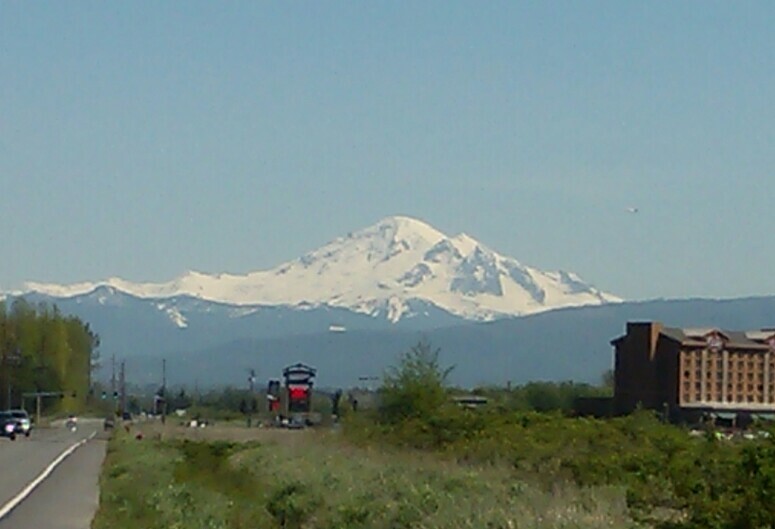 I parked my truck several miles south of the Skagit County line and was rolling northbound by 10:30. A word of warning to any who cycle this route. The roadway offers little accommodation for your bike. There are many parts of the road that have no shoulder and has either a rock wall or drop off to your side. It didn’t take long and I was down to wearing a sleeveless lightweight shirt and bike shorts. This would be the first ride I’ve taken this year that I did not at least start out with long pants and several layers of upper clothing. The traffic was mild which I appreciated very much. I made several short stops throughout the day whenever a photo opportunity arose. In less than an hour I was in Fairhaven. 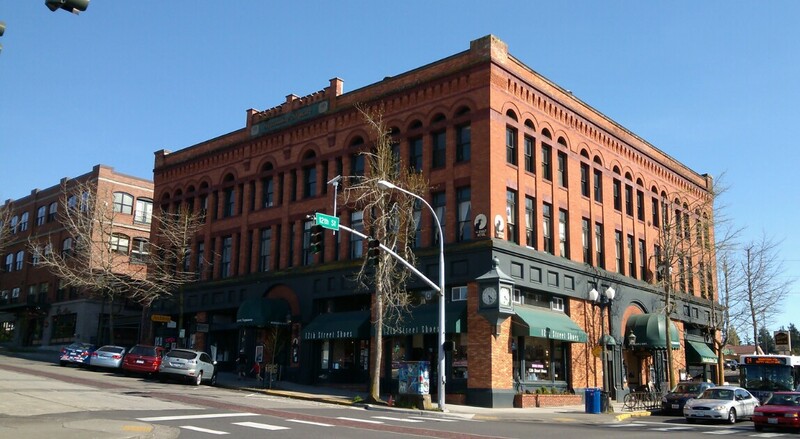 This town has some of the oldest buildings of the NW. 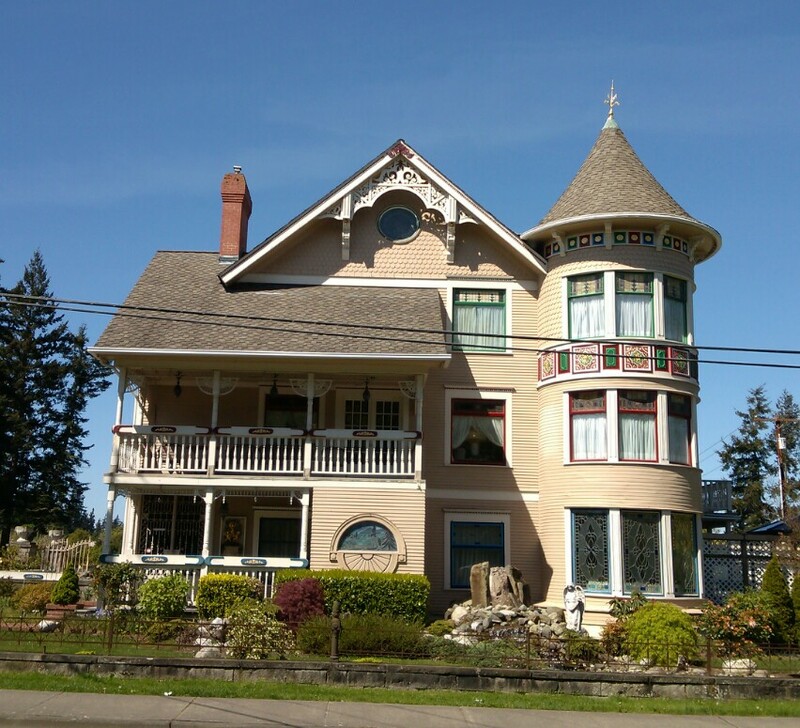 Fairhaven was incorporated into Bellingham as it joined with Whatcom, Sehome, and Bellingham in 1909. This town has always had a fun vibe to it. There are many little shops and cafe’s that occupy the old buildings. Most of the town has a great view of Bellingham Bay and the islands beyond. After a stop at Winn’s Drive Inn, I pedaled on to Boulevard Park. 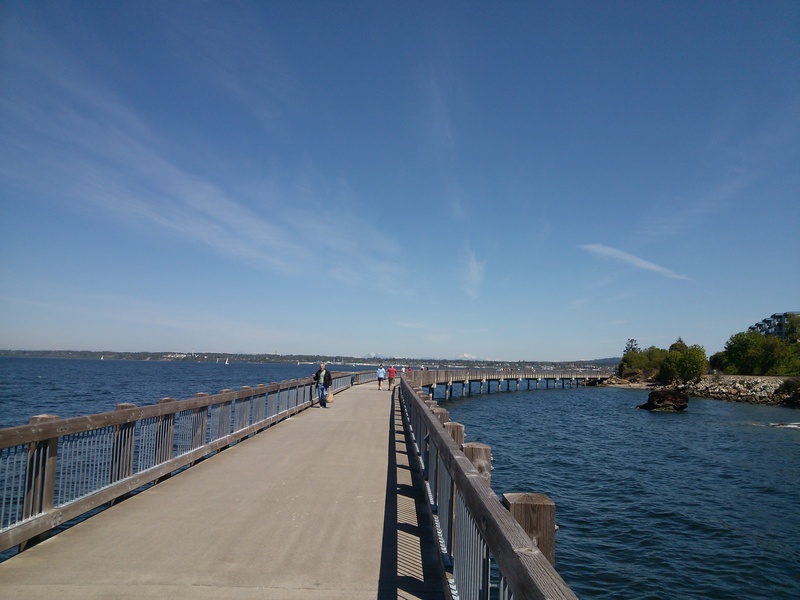 Many other people were out enjoying the sun as they walked the boardwalk that joins the south end of town with the park to the north. 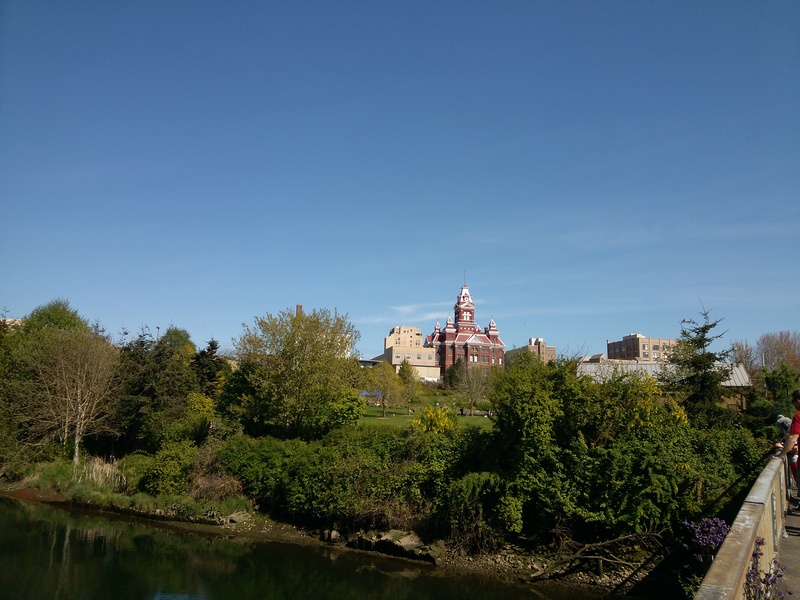 Bellingham is a college town and houses Western Washington University. The park was full of people walking dogs, playing games, sun bathing, and finding other ways of enjoying the weather. Sycamore Square, Fairhaven. Built in 1890. I found a sunny spot in the park and enjoyed my greasy lunch from Winn’s. The bay was full of sail boats dancing on the waves. I jumped back on the bike and continued north through town. I passed the Farmer’s market area that was buzzing with activity. I made my was NE through town and onto Marine Drive. As much as I enjoyed the activity of the city it was good to cruise on the open roads of the countryside. The commercial building had turned to open farmland and trees. I made my way towards Birch Bay but stopped a few miles short to visit someone. It was a quick visit as I had a long ways to go back. I took a different route back which took me east towards Ferndale on the appropriately named Mountain view Road. I stopped at a park next to the river to get some water and put on another layer of sunblock on. It wasn’t long and I was again entering the Bellingham city limits. I made a short stop to enjoy the Bellingham Procession of the Species parade. It was quite entertaining and bizarre. The costumes people wore were something in between a Maude Graw and Alice and Wonderland type theme and potentially influenced by LSD. 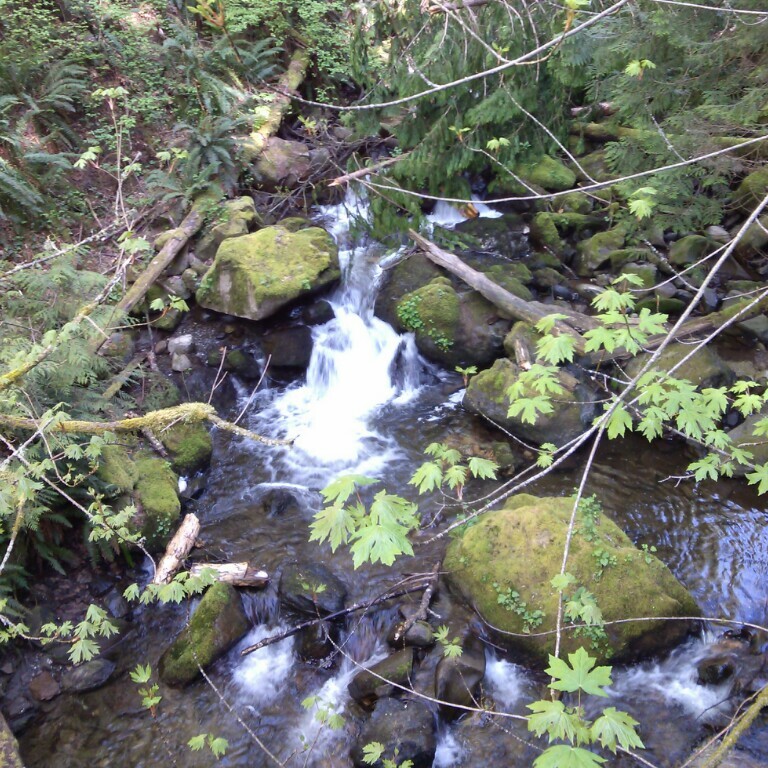 I rolled back on to Chuckanut Drive and stopped at Larrabee State Park. This is Washington State’s oldest State Park. I hauled my bike down the beach path steps to enjoy the sunset over the water. I pushed on for the last few miles where I my truck was parked. After peddling for 65 miles, I was glad to turn in two wheels for four. This was a great day and an even better ride. 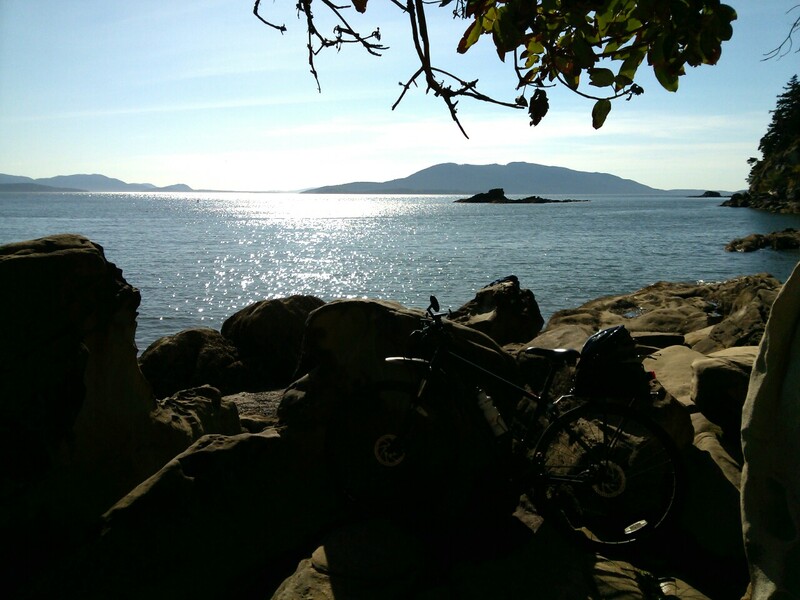 This entry was posted in Bellingham, Bicycling, Chuckanut Drive, Fairhaven, Mt. Baker, Photography, Washington State, Washington State Parks, Whatcom County. Bookmark the permalink. Very nicely done. Photos, history, colorful descriptions… Do I see a a future as a travel writer in your crystal ball? Thanks and I only wish I had the skills to do exactly that. This is an area I hope to develop in the future. You are well on your way my friend. Yes it is. There is nothing better than sitting on the beach there on a summer evening as the sun sets over the islands. I’ve never done the Chuckanut Drive (I’m a mountains kind of guy, going to the ocean feels to me like a day I could have spent in the Cascades) but your photos are stunning. I think you may have convinced me to put this on my list!